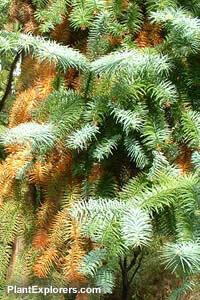 An elegant conifer, rare in western gardens. Suited best to damp climates as drier conditions may cause excessive browning of the needles. A real connoisseur's tree. The colouration of the needles and branches ranges from blue-green on new growth, through bright green on older material to bright golden yellow and copper on senescent branches. Height 70 feet; spread 20 feet. Sow seed in containers in a coldframe in the spring. Grow in moist well-drained soil with a generous quantity of organic matter worked in. For maximum freshness, please keep seed refrigerated in its original packaging until it is time to plant.